Properties for sale in Brittany, France - AHIB-3-M2195-2914968 • Huelgoat: Charming, tidy house, garden and outbuildings! 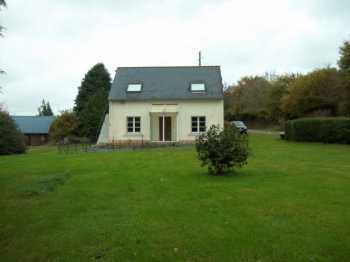 AHIB-3-M2195-2914968 • Huelgoat: Charming, tidy house, garden and outbuildings! AHIB-3-M2195-2914968 • Huelgoat: Charming, tidy 2 Bedroomed House, garden and outbuildings! Located in a small hamlet of just 3 properties in a beautiful rural environment, this property is perfect as a pied à terre in Brittany. The house is easy to maintain and the garden too. Habitable as it is, with no work needed. On the ground floor: The entrance is through a small veranda which opens onto the living room, bright and spacious, a beautiful fitted kitchen, modern, which offers good storage, the dining area and lounge around the house. pellet stove. Floor tile, electric radiators. Garden view. Also, a large bathroom with shower and a separate toilet. A solid staircase leads to the first floor where there are two beautiful rooms under very large velux windows, one with a door that gives access to an outside staircase. Between the rooms, is storage. She is very nice. A terrace to the front. The garden is easy to maintain and surrounded by trees. A few steps from the house, two outbuildings in very good condition, one used as a garage and laundry and the other very useful as a workshop. There are neighbours but you won't be overlooked. The setting is very pretty and calm. Worth a detour!